In an interview with The Independent, Nintendo president Satoru Iwata explained why the upcoming Nintendo 3DS XL has not squeezed in an extra Circle Pad. According to Iwata, while it would have been "possible", Nintendo would have needed to make the 3DS XL body even bigger in order for the second Circle Pad to fit. When we looked at the design of the 3DS XL, we had to look at various factors. One was battery life. One was the overall size of the unit. And we had to make some trade-offs. The choice, if we were going to include the second analog stick, was to reduce the size of the batteries or make the unit much bigger. What we wanted to do was have a bigger screen in comparison with the overall size of the system, so we had various discussions and had to make trade-offs, and this is the outcome. While there may not be a second Circle Pad on the 3DS XL itself, Nintendo has already confirmed that a 3DS XL Circle Pad Pro will be available later this year. I highly doubt they would have had to make the unit any bigger. It's already much bigger and they really didn't have to change much other than screen size. There should be plenty of extra space inside the thing for another slider. I get the impression that the 2nd pad is only really necessary for a very small number of games, and therefore makes sense to keep it out of this revision - the whole thing was blown way out of proportion. The exclusion of the second circle pad is a common criticism of the 3DS XL, but it is always overlooked that the Circle Pad pro also adds two more shoulder buttons to the system. To add the second circle pad means incorporating the entire Circle Pad Pro into the system, with added shoulder buttons. Even the PS Vita only has two shoulder buttons, it would be a significant form factor problem for any handheld system to have four shoulder buttons. I dread the day I get to see the Circle Pad Pro XL. should we be welcoming Katy Ellis, or have I somehow missed something? @y2josh Iwata is right. The xl would be bigger if they add the second ccircle pad. The system would be thicker because 95% of people fail to realise that the circle pad pro adds 2 more shoulder buttons. So the system would be bigger for the 4 shoulder buttons. I can't wait to see the Circle Pad Pro XL though,it'll be a thing of beauty. Talk about a circular argument. If the second circle pad was included in the 3DS XL, there would be a much larger base who owned systems with a second control stick, hence more games would be made that utilized it. A very small number of games support the Circle pad pro BECAUSE it requires an Add on, not the other way around. @SilentHunter382: The only thing I see in the article that mentions the CPP is the picture and at the end mentioning the CPP will come out later in the year. Iwata just says circle pad. Why would they need to add the extra two shoulder buttons to add a circle pad? @y2josh The Circle Pad Pro has the right Circle Pad and ZL and ZR buttons along with a replacement R. The extra two triggers would add more bulk to the system should they add them on. Unless you are willing for a Classic Controller style where the extra buttons are in between the L and R buttons? And besides, if he just added the right circle pad, it'd be useless. There aren't any games that use the CPP that don't also incorporate ZL and ZL except for Kid Icarus and (possibly) Kingdom Hearts. There's no real game were the 2nd analog is necessary, only optional and every game that has it works good even without it, i know from my experience with RE:Revelations. Nobody uses the 2nd analog even on PSVita, i've tried the console by a friend and only Uncharted uses it in a non useless way. So the question is: why gamers are saying that a 2nd analog on handheld devices is necessary when developers don't think almost about it? This is the same gamers cry that caused the Reboots and DLCs. @kyuubikid213: But how many game use the extra shoulder buttons? I'd just like the extra stick to be there for camera purposes. I don't play in 3D and games can't always know the right angle you need. i was hoping it could be included. controling camera without it is a pain in resident evil and even more in metal gear. i dint buy the games after playing the demos just because of that. and i do not plan to buy that odd craddle neither. unless are real good shooter comes in, ill skip. bring the rpgs like they flooded on the DS ! @chiptoon I was thinking the same thing welcome Katy, its good to see some sweet eye candy for once on this site and you also lived a Segarian childhood like myself. Nice! looking forward to reading more of your articles me lass. There is 7 games that uses the CPP, Since Monster hunter 3g isn't going to be localised, same for Dynasty Warriors VS and the CPP is only in the Japanese version of Ace combat. So there is only 4 games that are localised that use the CPP. I know 2 games that uses the LZ and RZ buttons and that is MGS3 and Resident evil. Kid Icarus doesn't use the 2 buttons but the second Circle Pad is really just designed for left handed users. Not sure on Kingdom Hearts. So 2 out of the 4 games that are localised use the shoulder buttons, maybe 3 if KH uses them. @y2josh Resident Evil Revelations uses it for the action button. Metal Gear Solid Snake Eater 3D uses it for the aim and shoot buttons. Kid Icarus Uprising uses them as shooting buttons. I don't know what Kingdom Hearts uses them for... Besides, Metal Gear uses ABXY to rotate camera and Kid Icarus and Resident Evil use the touch screen. Without the extra triggers, there is no CPP and you couldn't use the right Circle Pad in the first place. Also, if they did add the Circle Pad and JUST the circle pad, what would happen when a game came out that used ZL and ZR? You'd need a ZL/ZR attachment. I hate it when I feel that Nintendo is lying. "We would have to make it bigger?" Isn't that the point of the XL? And why? They have a D-pad and a circle pad on the left side, why can't the right side handle the exact same amount of buttons? Well, too bad for Nintendo I guess. They lost a lot of potential XL sales by not including it. Me and a lot of other people might have bought it for that. There's not reason to "upgrade" (lol) to it now. anyway I don't yet own a game that even supports the second stick, and the only genre I think would need it are FPS's. (personally I find it A LOT easier to play console FPS than PC FPS, but that's just me). FPS would be a must for the CPP. Also MGS 3 is a good example of where you should have the CPP when playing it unless you like aiming with the face buttons. With the second pad included, the screens only would have been like... 75% bigger instead of 90%, and that's just plain unacceptable. ...says the average fan, probably. Either way, Nintendo would have lost on putting the second circle pad on there. Since they didn't, everyone was complaining and questioning why. If they did, it would have sent mixed messages to consumers. Old 3DS owners would look at this and be put out and feel that they MUST upgrade, some who hadn't planned on upgrading would feel that they're outta luck because THIS is the newer 3DS and it's going to be getting all of the attention, updates, and maybe games. And some people would be wondering why didn't Nintendo do this in the first place? The last thing Nintendo needs is more confusion. Well, First I would say Hello and welcome Katy to the site. Second, I would like to say that there really isn't any need for a second circle pad because the only game I NEEDED a second circle pad for was Metal Gear Solid. So, for all the whiners out there who complain about no 2 circle pads. Just realise there ain't no games out there that need it. So If you just play Metal Gear Solid all the time then get a Circle Pad Pro. No Big Deal! 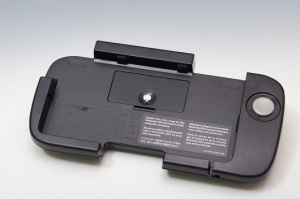 People think you can put in a Circle Pad on top and the internals magically solder themselves. Having just the Circle Pad and now the shoulder buttons would divide things even more. 3DS Scheme, CPP Scheme and 3DS XL Scheme. Developers would have to work with all 3 and if they don't then people will complain how they aren't being used. Also to whoever said who cares if they made it bigger and that was the point of the 3DS XL, people are complaining already that it's too big. You want it BIGGER?! The 3DS XL also takes more power to run those screens, so they added a bigger battery. Again people would complain about the battery life then. 3DS XL has worse battery life?! Fail. I think they made a good decision in what to include and what not to. From what I understand, a second circle pad would take up space inside the system that is actually dedicated to the battery. As stated in the article, one of the focuses of the XL was better battery life. Just adding a second circle pad isn't so simple. There was room for it, definitely. The real reason is it would divide the 3DS user base. Nintendo doesn't need that. @SilentHunter382 You got the right idea, but there's more. The 3DS and CPP do infrared connection. The built-in circlepad would waste that infrared port. Also, the circlepad would take up more room. It's not as simple as just placing a circlepad somewhere. EDIT: Also, including it would make original 3DS owners, especially Ambassadors like myself that paid $250 (or whatever it cost in your country) very angry. Between the increased size of the battery, the additional shoulder buttons and the screen size itself, there's absolutely no way the circle pad could be added without making the system bulkier. Batteries generally don't get "slightly" bigger when it comes to the rechargeable type (with adapter). They become a lot bigger. As Miss_Birdo pointed out there's also the whole aspect of soldering. People also fail to realize that a circle pro would not have been that feasible on the original 3DS. Has anyone actually checked what its weight is like? For a system of that size its pretty hefty. The mass volume ratio is pretty high (high mass and low volume) meaning the system is already pretty stuffed as is. Thank you Iwata for reiterrating what I've been saying the whole entire time. And seems like people STILL don't get it even here. Truthfully, the 2nd CP is not mandatory, but the problem is many devs aren't using the in game camera, touchscreen, gyrometer, etc. cleverly enough to not need. MGS3D:SE is my classic example of this where an 2nd pad greatly helps. I more or less blame Kojima for that one, but still, having the option for a 2nd pad would further extend the playground for devs to use ANY of the above I've listed. At least Nintendo is more than aware and/or have been thinking about a 2nd CP for the 3DS. I think do to the complaints, when the next 3DS revision comes, I think it will be a lock for it to be there. Hopefully by then, the battery will be extended even further and the viewing angle improved even better. I can't believe there are naive people eating up this manure Nintendo is feeding them. To say s 2nd analog isn't needed is to say you're not interested in traversing 3D environments efficiently. Touch screen? Yeah you can put a touch screen 2nd analog on the screen and have it be uncomfortable and not reliable for action packed games which require good control of the camera at all times. Use the Gyro controls? What, so I can move the 3DS around, the 3DS that requires you keep it still to view the 3D? Press a button to zoom the camera behind you? This works, if the game's combat isn't difficult, the enemies not mobile, numerous or dangerous, and allows for slow camera controls. I want you to imagine playing a moderately difficult action game like Bayonetta or Infamous where knowledge of your surrounds is essential to survival against enemies and say slow or unwieldy substitutes of camera controls are okay. There is nothing wrong with multiple control options. Few will tell you Metal Gear Solid 3 plays better without the Circle Pad Pro, but the option is there, and it works fine. Telling developers to have multiple control options is not the biggest hassle in the world, you can have a comfortable 2nd Analog to control the camera, or a touch screen substitute that's much less comfortable and still works. And the Wii Motion Plus is the definition of what some are saying Nintendo "doesn't want to do". They already did it, made a peripheral that some of the main Nintendo games use, and allow developers to use at their leisure, until they finally released the Wii Remote Plus, which is just what people want of the 3DS NOW. This is EXACTLY what I've been saying this whole time! And shame on those of you who went from "where's the #@*% circle pad?!" to "well I suppose we don't need it anyway." Seriously, check my previous comments, I HAVE PROOF! This is how I see it, and I don't think there's any other way to see it. Nintendo has been playing this game for decades. It's nothing new. Open your wallets, kids. Shame they didn't notice that CCPro has ZLZR buttons which would make the 3DS far more thicker than it should be which = complaining regardless. If so many of you believe that Nintendo is just out to squeeze every last dime from you why do you even bother giving them your money in the first place? There are several legitimate reasons why a second circle pad was not added yet you can't see beyond your own distrust of the company. QFT, i'm sure Iwata knows better than some random fans. I still don't really view the XL as a new iteration. They're not doing something new like they did with the DS lite or DSi, just making the existing console bigger. When there's finally a redesigned version, we'll see a second circle pad. By the way, are you new to the site, Katy? This is the first time I've seen one of your articles. Welcome to Nintendolife! How many games actually use this thing? 3? It would've cost more than it was worth. Oh well. I played games using the N64 controller just fine, so one analog pad on the 3DS is no problem. make the screens a little smaller and fit the 2nd circlepad just like that... omfg! Perhaps it should also be mentioned that the XL was never meant to be a replacement like some people want to think here. It's supposed to be an alternative option for those who prefer bigger systems. Think about this: if the second pad was going to be required for many games, it should have been incorporated in the system at launch, not one year later. Nintendo has made it clear that the second pad will be an option, not a requirement. There is no reason anyone should redesign a console to incorporate features later that are required and can't be used by all. Oh, and before you argue for the Wii Motion plus: that is a controller, not a console. The 3ds has never needed another circle pad. I wish everyone would just get over it. Nintendo knows better than you people who thing there wrong. A Second analogue stick is pointless and useless. The 3ds has better options like the gyro and the stylus. Nintendo added the CPP for MH and if it has uses for other games as an accessory good. Definitely should not be integrated to the system. @Koos as someone pointed out above, gyro would not be a good chocie because it means the 3d effect would need to be disabled, and even if you dont like the 3d effect it would be difficult to focus on gaming whilemoving it around. Nintendo's stance on the second circle pad isn't very good imo. Here's the deal. There are only a few games that use the second circle pad because hardware isn't built in. Because it's not built in and requires people to purchase it separately, it doesn't have a large install base, not to mention there are many skeptics, like myself, who don't want to buy it because it uses separate batteries. Of course, lower install base means less support in particularly from western publishers. On that same note, many western games require a duel analog set up or something close (wii remote pointing) to work and the lack of this also means lack of their support as well. Basically what I'm saying is it's a losing situation to not offer this. Even if they do add a second circle pad in the system in a later redesign, because it's not happening earlier in the systems life, it is doubtful that it will turn heads and draw support (like wii motion plus). When will they learn? Don't really care about the article, can i have katy"s phone number tho!! Promise i won't tell the wife. I already own a 3DS XL Circle Pad Pro. It's very hard to find. I can even post pics/ help you guys get it. PM me or whatever if you need it.